This month’s post on the A4NH’s Gender-Nutrition Idea Exchange looks at how women’s empowerment affects nutrition outcomes in one of A4NHs priority countries, Ethiopia. We speak to Feiruz Yimer and Fanaye Tadesse, Research Officers at IFPRI’s Ethiopia Strategy Support Program, who use Ethiopian household survey data to investigate the link between women’s empowerment and diversity of diets. 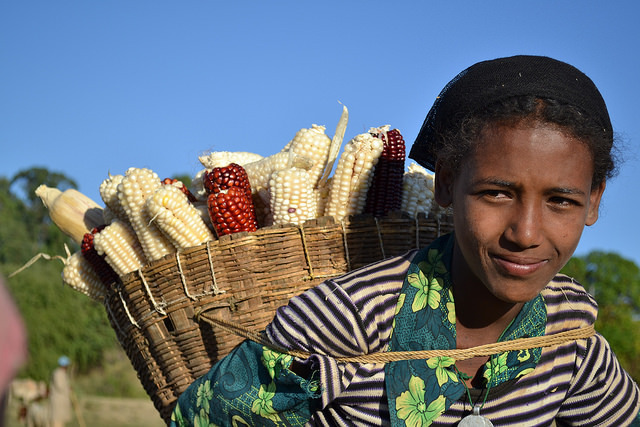 A4NH: What is the current status of nutrition and women role in agriculture in Ethiopia, both regarding indicators as well as government policies and initiatives? Feiruz and Fanaye (F&F): Despite some improvements in child and maternal nutrition in Ethiopia, undernutrition remains a developmental concern – 40 percent of children under the age of 5 are stunted, and 30 percent of women of reproductive age are chronically malnourished (Beyero, Hodge and Lewis, 2015). Women and children in rural areas are nutritionally worse-off compared to their urban counterparts as access to improved food sources, health facilities, and other infrastructure is limited. Women in rural Ethiopia have full responsibility of taking care of their family particularly children, even as they participate in agricultural activities within and beyond the household. In both these realms, however, their role in decision making is limited which is a cause for concern because women's empowerment is critical for achieving better nutrition. Empowered women can have more control within a household and greater access to resources required to care for themselves and their children (van den Bold et al. 2013). 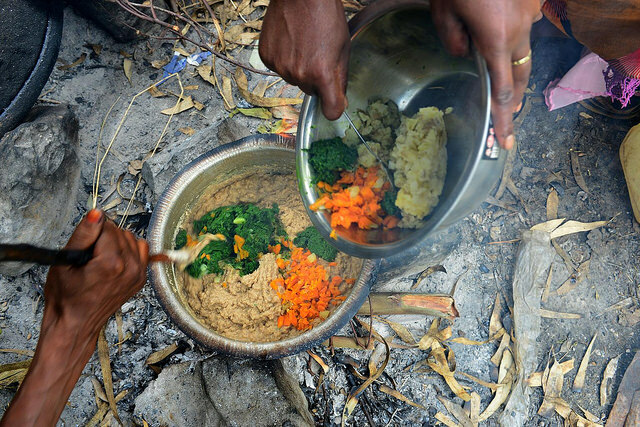 In order to address the undernutrition problem, the Ethiopian government has launched a National Nutrition Program (NNP) which recognizes that women’s access and control over household resources, time, knowledge and social support networks is a barrier to improving nutritional outcomes in Ethiopia. Efforts are also being made by the government to create awareness and increase knowledge of consuming a balanced diet and projects have been designed and implemented to empower women to increase their engagement in and control over economic activities. A4NH: What are the main research questions of your study and what methodology did you use to answer these research questions? F&F: There is limited evidence in Ethiopia on the agriculture-nutrition pathways related to women’s empowerment (Beyero, Hodge and Lewis, 2015). Our study, therefore, aims to fill this gap by investigating if women’s empowerment in agriculture is associated with greater dietary diversity in rural Ethiopia. Data for the study came from a baseline survey conducted in 2013 by the Central Statistics Authority of Ethiopia in collaboration with the IFPRI for the Feed the Future program (FTF) which covered about 7000 households in five regions of the country. Empowerment is measured using the multidimensional Women Empowerment in Agriculture Index (WEAI). One of the components of the index, known as the Five Domains of Empowerment or 5DE, uses a set of indicators to measure an individual’s achievement in five domains of empowerment in agriculture – production, resources, income, leadership and time. In our study, we selected an indicator from each domain that contributed the most to the disempowerment of women within that domain and looked at its relationship with dietary diversity. The selected indicators include autonomy in production, access to and decisions on credit, group membership, and workload. To measure dietary diversity, we used 24-hour recall consumption data to calculate the mean number of food groups that were consumed by children and women. In our sample, we find dietary diversity scores to be very low for both children (1.25 out of 7 food groups) as well as women (1.56 out of 9 food groups). A4NH: What are the main contributors to women’s disempowerment in Ethiopia? F&F: The calculated WEAI for our sample, which includes both FTF zones and non-FTF areas, is 0.69. The score is higher than or equal to some developing countries such as Nepal (0.58) and Guatemala (0.69) but is low compared to Bangladesh (0.750) and Uganda (0.79). The main contributors of disempowerment in Ethiopia are the leadership and time domains which account for 30% and 27% of disempowerment respectively. 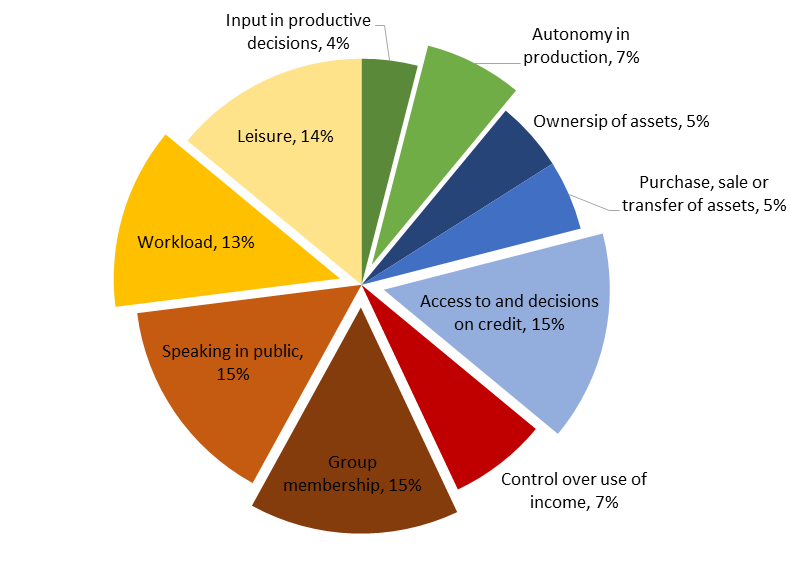 A disaggregation of the domains at the indicator level (as shown in Figure 1) indicates that apart from being disempowered with respect to leadership (group membership and public speaking) and time (workload and leisure), a lack of access to and decisions about credit is another source of disempowerment for women in Ethiopia. A4NH: What are your main findings? How do your results compare with other studies? F&F: We find that women’s empowerment in agriculture has a positive and significant relationship with child and maternal dietary diversity scores. Similar results have also been found in studies in Ghana (Malapit and Quisumbing, 2015) and Nepal (Malapit et. al, 2015). Moreover, we find that all four indicators of empowerment that we had selected (autonomy in production, access to and decisions on credit, group membership, and workload), have a strong and positive association with dietary diversity. A4NH: How can policy makers and program implementers use these results? F&F: This study provides evidence and support to the government’s efforts of focusing on women to achieve better health outcomes. Our hope is to inform policy makers and program implementers that their investments have been made in the right direction and to encourage them to include activities to empower women in their programs. To this end, we have shared these results at various workshops and seminars to both agriculture and nutrition stakeholders. These include the National Nutrition Program Research Dissemination Conference in 2014, the Together for Nutrition conference in 2015 and various meetings with the Ethiopian Agricultural Transformation Agency and the Ministry of Agriculture and Natural Resources. Malapit, H.J.L., Kadiyala, S., Quisumbing, A.R., Cunningham, K. and Tyagi, P., 2015. Women’s empowerment mitigates the negative effects of low production diversity on maternal and child nutrition in Nepal.The Journal of Development Studies, 51(8), pp.1097-1123. Malapit, H.J.L. and Quisumbing, A.R., 2015. What dimensions of women’s empowerment in agriculture matter for nutrition in Ghana?Food Policy, 52, pp.54-63. Ruel, M., 2015, From the WDDS to the MDD-W: Get to know the new indicator for measuring women’s dietary diversity. Ruel, M., 2014, Dietary Diversity 101.